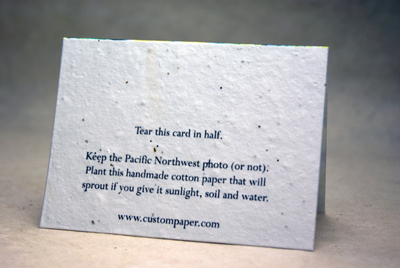 Handmade seed paper cards with our exclusive nature photos. Our handmade papers are formed one at a time with a mould and deckle. They are made with 100% post industrial waste and are 100% tree free, acid free paper. Embedded in this stock is our unique North American Wildflower seed blend. 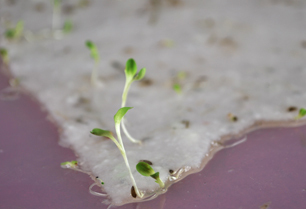 The seeds will need four hours a day of direct sunlight with constant watering until established. The plants can grow to as tall as three feet. The seeds include Snapdragon (Annual), Petunia (Annual), Beardtongue (Perennial), Daisy (Perennial), Thyme (Perennial), Poppy (Annual), Foxglove ( Biennial/Perennial ), Catchfly ( Biennial/Perennial ), Maiden Pinks (Perennial), Chamomile (Perennial). This blend is specifically designed to allow us to print directly onto the handmade seed paper and for safe propagation across North America. This card has the text printed on the textured side of our stock, on the reverse is a smooth surface that feels luxurious under your fingertips and accepts most pens for your hand written message. We are happy to print a custom message on the inside for a $30 setup fee and an additional $0.75 per card. Germination may begin as quickly as one week or may take up to six weeks depending on your growing zone and planting depth. We recommend just 1/4 inch of soil coverage.